The closer in time we get to the day the General Data Protection Regulation (GDPR) goes into effect in the EU; the higher the chances are that you will be facing a much more concerned and ‘private’ customer. By May 25th, 2018, we’re expecting to see the EU promote consumers’ rights under its new legislation. If this indeed happens, it will be the perfect occasion to use GDPR to build trust with both existing and potential clients. Instead of seeing it as another stick in the wheels of hard-working entrepreneurs, using the principle behind data protection as an opportunity to leap ahead of competitors. 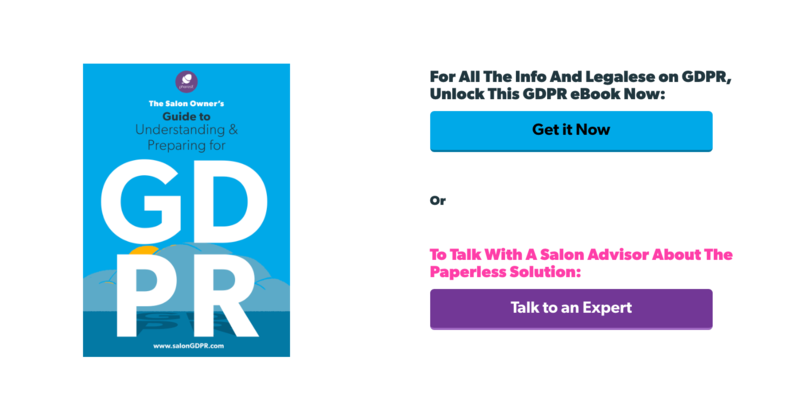 If you’ve recently downloaded our Salon Owner’s Guide To Understanding And Preparing For GDPR, then you’ll have already read about this. Let us reiterate. For GDPR, your salon must prove it has a legal basis for collecting the client’s personal information i.e. you cannot collect personal information without reason or simply say it is for marketing. The right to be informed: Clients must be informed before personal data is gathered. It must be opt-in, and the reasons for collecting personal data must be provided. The right of access: Clients have the right to request access to their personal data, and for information on how their data is used after it has been gathered. The right to rectification: Clients can have their personal data corrected if it’s incomplete, incorrect or out of date. The right to be forgotten: If clients are no longer customers or withdraw their consent to use their personal data, they retain the right to have their personal data deleted. The right to data portability: Clients have the right to request that you transfer their personal data to another business in a commonly used and readable format. The right to object to processing and direct marketing: Clients can request their personal data is not used for processing. Their personal data can remain in place but not used. The right to be noticed: Clients have the right to be informed of a breach of their data within 72 hours of its discovery. Sounds arduous? This is the perfect example of why you need a GDPR-compliant salon software. If you are using pen and paper and maybe an online email tool, for example, it will be virtually impossible to ensure all your clients’ rights are respected. Also, how do you delete a client’s details from pen and paper if you have multiple entries in different diaries? What if we said you could turn it into an opportunity to build trust with both existing and potential clients? Providing you with the industry’s first fully digital compliant consultation forms meaning you opt-in all clients in a traceable way as per GDPR legislation. Giving you filters and tools to create marketing campaigns using email, social media and SMS that are opted-in and won’t get you in trouble when clients request a copy of their consent! Ensuring that all data stored on the system is fully encrypted – meaning you and the team are protecting your clients’ data from leaking! Let’s start with this angle because it’s the easiest. Your existing customers already like you, already trust you. Just like in any relationship, it’s all about communication. Reassure your clients. Show them that you care about their privacy and personal information. In fairness, it’s very likely that a massive percentage of your existing clients won’t ask any questions. For them, it’ll be business as usual, GDPR or not. For the others who do, make sure you and your staff are educated about the legislation and compliant with it. Calmy answer your clients’ queries and reassure them by showing them you’re in control of the situation. The goal is to make them feel like they can go about their day without any concerns towards the seriousness of your business in the whole matter. With new customers, however, that’s when it gets interesting. Again, not everyone will be obsessing over how their personal information is gathered and protected, but it can certainly play in your favour to explain just how ‘safe’ it is to do business with you. Take something as simple as a patch test. Tell them why you need to hold any medical or contact information about them, what you’ll be using their data for and who will have access to it. Inform them about their rights too, don’t keep it from them. The key is to be as transparent as you can; after all, that’s what builds trust in any relationship. Honesty and care. 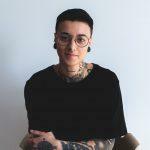 Given the amount of – sometimes very sensitive – information clients need to provide you with to ensure safe treatments and services, it’s likely they will be looking for the one place that makes them feel safe. I mean, the only other professional who’d have this much personal information about them would probably be their doctor! So if you assure them that you care about their data and are GDPR compliant, you’ll have an instant advantage over your local competitors, and win these new clients’ trust. You know what they say… Communication is key! *Phorest Salon Software’s imminent release of the Digital Consultation Forms will take care of most of this. The client will fill out the form, and you will review their answers with them, after which the client will sign the form, and you will validate it in the system, with your staff pin. If you are Phorest client and would like to learn more about this feature, please click here. Not a Phorest Salon Software client yet and would like to get a quote? Please click here.